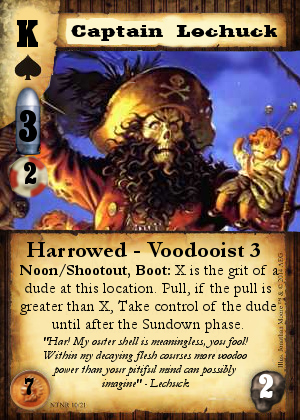 Hello, I'm working on making a good template for custom Doomtown cards for everyone to use, but I require a few things to make it work. 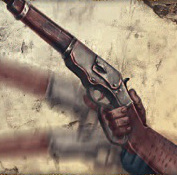 Is there anyway to get a 'Blank' Bullet and Influence image? This would be useful to have more theoretical characters with influence and bullets higher than that already in the game. What is the actual font used on the cards? I can get a few things close but nothing looks exactly right. I found something online for it, but that was for Doomtown classic and the fonts don't look 100% alike. Also is the font for the text the same as the font for the Suit value and Bullet/Influence number? Is there any place to get the full art of already released cards? This is less relevant to this project, I'm still a bit curious. I think this could be interesting for a few reasons, First being it would be interesting to 'See' fan made cards that we come up with on the forum. For example, there's a hearthstone community on Reddit that holds weekly competitions for fan-made cards, and something like that could be interesting there. 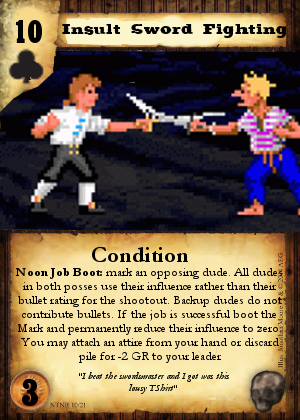 The second being I find custom cards to be incredibly useful Deadlands standees, here's and example of one I made a while ago, that I like to improve on. I would also be perfectly happy if anyone else made their own custom card file, but for what I searched I didn't see anyone make one. Have you joined the Facebook group on Fan Art Works? I believe that group has a compilation of backgrounds for all card types, factions and also some fonts. About existing cards, I’ve found the images on dtdb to be in pretty good resolution. 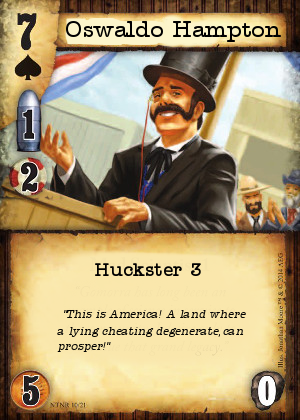 The typeface for card titles appears to be "Saddlebag", but reduced in width and kerning. Keyword/Ability/Trait text is basic Garamond (not Adobe Garamond Pro) and Garamond Italic, or something really close to it. I have not looked into the Ghost Rock and Suit fonts. They are not Saddlebag. Normal text is Adobe Caslon Pro, I believe. For blank versions of the icons and what not, a lot of that is in the asset pack from the learn to play video contest. Direct link here. Here's the first one I came up with, I think it looks alot better than my Oswald above. I'm in favour of more Monkey Island/Doomtown crossovers. Why gun fight when you can insult duel? "I beat the swordsmaster and I got was this lousy TShirt"